VEGFR3 has not been tested, but is expected to react. Synthetic peptide (Human). The sequence is conserved in mouse and rat. NIH 3T3 cells transfected with full length, wild-type human VEGFR 2 and Porcine Aortic Endothelial cells transfected with a chimeric receptor consisting of the extracellular domain of the CSF 1 receptor coupled to the transmembrane and cytoplasmic domains of the mouse VEGFR 2. The antibody has been negatively preadsorbed using a non-phosphopeptide corresponding to the site of phosphorylation to remove antibody that is reactive with non-phosphorylated VEGFR 2 protein. The final product is generated by affinity chromatography using a VEGFR 2 derived peptide that is phosphorylated at Tyrosine 1214. Our Abpromise guarantee covers the use of ab5475 in the following tested applications. WB Use a concentration of 0.35 - 1 µg/ml. Detects a band of approximately 200 kDa. Publishing research using ab5475? Please let us know so that we can cite the reference in this datasheet. Thank you for your enquiry. 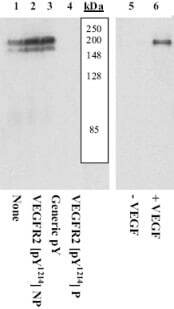 This antibody will recognize VEGFR-2 only if it is phosphorylated on Y1214.We would like to emphasize the fact that this antibody has only been tested for Western blot application.